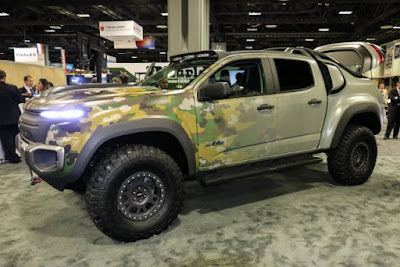 One of American renowned automobile manufacturer, General Motors introducing and demonstrating a truck with camouflage features for military purposes, on the sidelines of the Association of the U.S. Army conference in Washington DC. 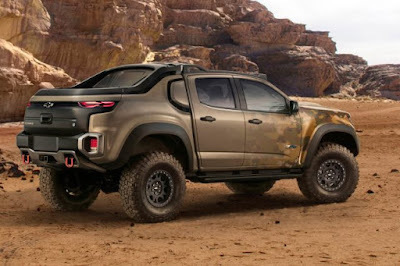 Chevrolet Colorado ZH2, is an electric truck is equipped with hydrogen-fueled engines that drove silent and has cooler engine temperatures (between 60-80 degrees Celsius) compared to the conventional cars. This truck was even serves as a base of military operations with the capability of producing 25 kilowatts of electricity in a sustainable manner, even up to 50 kilowatts at peak output point, as well as two gallons of water per hour. This vehicle was built using the base of a Chevy Colorado that have been modified in such a way so has offroad capability by using larger tires, better suspension, longer wheelbase, and so forth. The e-truck was developed as a result of cooperation of GM with the Tank Automotive Research, Development and Engineering Center of the US Army (TARDEC) to ensure the ZH2 meet the needs of the military since the contract was signed a year ago. Since a year of the cooperation until the prototype model for the demonstration finished was a fast time, but the relationship of GM and TARDEC has lasted no less than four years since they work together to research the fuel cells in both research laboratories each of which have a distance within only 20 minutes. "They provide some of their testing facility to our and integrate it into our labs," said Director of TARDEC Paul Rogers, as reported by the Defense One. In January 2017 later, the car will be taken over by the US Army and tested by their personel in off-road terrain at Fort Bragg, Fort Benning and Quantico as well as a number of technical tests in Michigan. Rogers also said that the Command of US Special Operation Forces (SOF) will also intervene to test these vehicles, especially camouflage features are extremely appropriate for SOF missions. "The ability to put yourself on the battlefield without being detected by enemy, of course that's the SOF affairs. There are also other functions, including reconnaissance, surveillance and targets acquisition," Rogers said in the demonstration event the vehicle is on Sunday evening, October 2, 2016 local time. Meanwhile GM's Senior Project Engineer Christopher Colquitt, who led the project insist the ZH2 not a combat vehicle, given that it was unarmed and would probably cannot withstand an improvised explosive device (IED). "The things that must be considered for the combat ready vehicles," he said further. 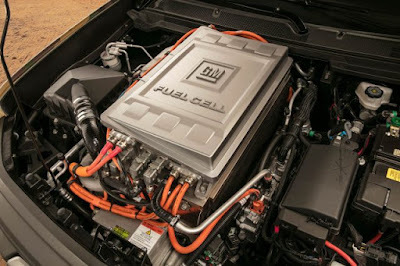 GM and the US Army is optimistic that hydrogen fuel cell systems will be used more than once demonstration period, although everyone who remembers the Hindenburg tragedy will probably think twice to run with hydrogen fuel vehicles, including cars. "Hydrogen is the fuel. Does it have a flammable particles under certain conditions? Yes. However, pure hydrogen is not burn easily. You have to mix it with the air and have a source of lighters," said Colquitt referring to his remarks on the Hindenburg. The truck is equipped with three compressed hydrogen tube at the rear of the vehicle, which is made from carbon fiber an inch thick in order to maintain the hydrogen from fire and air.